Internet Jetset Review | Is Internet Jetset Scam? – My Personal Experience Webokane Review – The Biggest Scam Of The Year? 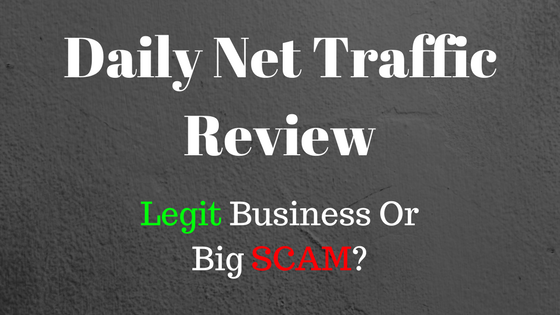 Daily Net Traffic Review – The Biggest Scam This Year? Welcome to my Daily Net Traffic Review! Daily Traffic Net has gained a great deal of popularity lately on social media from those looking to make extra money online. Current affiliates seem to be working overtime in order to attract new people, but many are hesitant due to lack of information regarding the company. The following review will assist you in your quest so that you make the very best decision for yourself and your bank account. This Daily Net Traffic Review will be completely unbiased and will enlighten you to how affiliates are treated, compensated and whether the opportunity is legitimate or an elaborate scam. DailyNetTraffic.com was officially registered on July 4, 2015, to John Kielec of Ontario, Canada. When viewing the company site, it is hard not to notice the amount of spam that resides there. There is an incredible number of ads for additional “opportunities” at the bottom and an unhealthy amount of dollar bill graphics flying about. Unfortunately, there was no information regarding the base of the company or who the actual owner is. This is a rather large red flag. For those that are relatively acquainted with the industry of multi-level marketing (MLM), the name John Kielec will seem a bit familiar. He has been behind an array of less than savory schemes within the industry over the past few years. With that being said, Daily Net Traffic could very well be his latest scheme. When viewing the website, it is evident that affiliates of Daily Net Traffic have no products to market. What is clear is that an affiliate membership is the ONLY item for sale. Keep in mind that a legitimate MLM would have services and products listed and available for its affiliates to sell and market. Given that the only thing for “sale” via Daily Net Traffic is the affiliate membership, the compensation is basically cash gifting. Once a person becomes an affiliate, they are required to gift new affiliates that they attract with between $2 and $200. The tracking of this cash gifting is tracked via a 2X6 payment matrix. For those that choose to join the company in an affiliate capacity, to begin you will need to gift your recruiting affiliate $2. From there, you would be gifted $2 for (a minimum of) two recruits of your own. This is the first level of compensation. There is a total of six more levels within the matrix that work similarly with a varying number of sums being paid out. There is also mention of an additional matrix that can be unlocked by affiliates once the third level has been achieved. According to the company’s website, an affiliate has the potential to earn $640,000 with no clear stipulations as to how that can be achieved. To enter the entry level of the company, you will need to invest $2. Should you choose to become involved in all the levels listed above, you should plan to invest (approximately) $285. There may also be hidden costs within the matrix that are not publicly displayed on the company site. Is Daily Net Traffic Worth the Investment? With all the information that has been discovered and discussed in this Daily Net Traffic Review, it is quite apparent that this is NOT where your money should be invested. This company appears to be nothing more than a replica of all Kielec’s past MLM schemes. The cash gifting compensation pyramid is a sure sign that you will lose your money upon joining. The only person that will truly make any money from Daily Net Traffic is John Kielec. This is due to the fact that Kielec provides himself with pre-loaded positions that guarantee himself the majority of the money that is being brought in. If you are truly interested in embarking on a home based business, there are far better and reputable companies for you to choose from. Look for companies that have actual services to offer as opposed to simply memberships for working for the company. I really love the business of Affiliate Marketing and it is what I truly recommend if you are looking to start a business online. It is by far the most ethical, easy, and affordable way to start seeing some commissions in your bank account. Right at this very moment, you have an opportunity to join a successful community of affiliate marketers whom all have income generating business in various niches. I am a part of this elite group, so, therefore, I will offer you an invitation to join us. You will learn the top 4 steps you need to take in order to create your own affiliate website – and trust me, it is easier than you think. The good thing about all this is that you get to signup for free and then within 7 days will have the opportunity to invest in the elite premium package for $19/month and $49 thereafter. You will get the websites, the hosting, the training, the tools, and the support from me as well as access to the 2 CEOs of the company. >>Click here to get more details and free access! If you have any questions or would just like to share your thoughts about this review, simply do that below. Also, please share this article, so that others may know what the Daily Net Traffic is all about.